Q1. In a totally stubby area, which routes are not propagated into the area? Answer: There will be no summary or external routes propagated by the ABR into the area. Q2. Where would you see whether a learned network was within the same area as the router you were looking at? Answer: The show ip route command identifies how the route was learned. If it is a network from another area, it will have the code IA next to it. Q3. An Area Border Router must be resident in which area? Answer: An Area Border Router must be resident in Area 0 as well as the area that is connecting to the backbone area. It will have two topological databases, one for each area it is resident in, so that it knows how to forward traffic. Q4. What does ABR stand for, and what LSAs will it forward? Answer: ABR stands for Area Border Router, and it forwards summary LSAs. It forwards both Type 3 LSAs and Type 4 LSAs. Type 3 LSAs are forwarded to the other ABRs, and Type 4 LSAs are forward to the ASBRs. ABR also forwards Type 3 LSAs from other areas into its own area. Q5. State two advantages in creating areas in OSPF. It is easier to manage and administrate. It uses a smaller topology table, which reduces the CPU, memory, and network bandwidth consumption. Fewer SPF calculations are involved because the topology table is smaller and there is less likelihood of change in the network. It uses a smaller routing table if summarization is in operation. Q6. What is an external route, and on which type of router will this route be introduced? Answer: An external route is a route that did not originate in the OSPF domain. It has been redistributed from another routing protocol or static routing. An external route is introduced into the OSPF domain by an Autonomous System Boundary Router (ASBR). Q7. Which command in OSPF shows the network LSA information? Answer: The command show ip ospf [process-id area-id] database network displays the network link state information. Q8. Why is the use of VLSM important in the design of OSPF? Answer: VLSM is important in the design of OSPF because it supports a hierarchical design and allows for the summarization of IP subnets between areas. Q9. Given the networks 144.12.8.0 and 144.12.12.0, both with the mask of 255.255.255.0, is it possible to summarize these into one subnet? If so, state the new subnet and mask. Answer: The new subnet and mask will be 144.12.8.0, with a mask of 255.255.248.0 or /21. Q10. What is a discontiguous network? Answer: A discontiguous network is a network with a major network number (NIC number) that has a different NIC number dividing it. For example, consider the network 131.10.1.0 appearing on a LAN in San Francisco and the network 131.10.2.0 appearing on a network in San Jose. These are both subnets of the major network 131.10.0.0. If these subnets are connected over a Frame Relay link that has the address of 10.10.10.0, the network number 131.10.0.0 would be discontiguous because it is not configured contiguously. This is not a problem for routing protocols that carry the subnet mask. Q11. 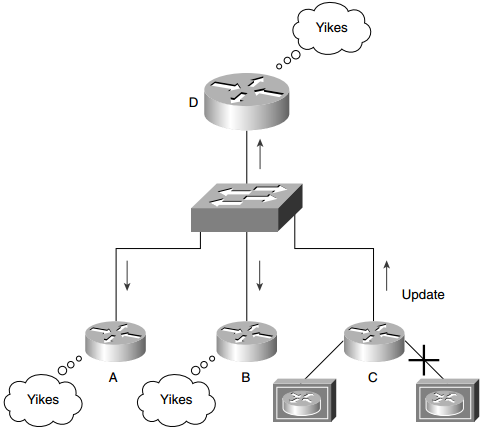 A virtual link in OSPF is used to solve what problem? Answer: The virtual link provides the disconnected area with a logical path to the backbone. The virtual link must be established between two ABRs that have a common area, with one ABR connected to the backbone. It can also be used to connect two area 0s together. This may be necessary when two companies merge, each with its own area 0, or if, due to the loss of a link, the area 0 becomes bisected. Q12. State one disadvantage for making an NBMA Frame Relay cloud Area 0. Answer: Creating the Frame Relay cloud as one OSPF area, preferably Area 0, causes summary LSAs to be flooded throughout the Frame Relay network. This results in a large number of routers recalculating whenever there is a change that requires the topology table to be updated, and the Frame Relay cloud may become saturated. If the Frame Relay cloud has a problem, then the entire network may well suffer. Q13. State one advantage in making the centralized routers and network resources dwell in Area 0 while the Frame Relay cloud and the stub remote LANs reside in satellite stub areas. Answer: One advantage of this design is that any flooding of external LSAs is prevented from entering the Frame Relay network because it is a stub network. This reduces the network overhead. Q14. How does creating the number of areas in OSPF reduce the number of SPF calculations? Answer: The number of SPF calculations is reduced because the size of the topology table is reduced. This lessens the likelihood of a change in the network and, thus, SPF calculations. Q15. How does a stub area differ from the backbone area? Answer: A stub area differs from the backbone area in that it does not propagate external routes into its area. The backbone is obliged to forward these LSAs to ensure connectivity throughout the network. Q16. How does a totally stubby area differ from a stub area? Answer: A totally stubby area differs from a stub area in that it propagates neither external routes nor summary routes from other areas. This is a Cisco solution to minimize the amount of CPU and memory required of the routers within the area. Connectivity is achieved by the use of default routes, which are advertised to the internal routers. Q17. State the different LSA types. Router link—Sent by the router, stating the links directly connected. These are flooded through the area. This update is identified by the type code Type 1. Network link—Sent by the designated router, stating the links for the LAN for which it is the designated router. These LSAs are flooded throughout the area. This update is identified by the type code Type 2. Summary link—Sent by the ABR into the backbone. It states the IP subnets within the area that are to be advertised into other areas. This is where summarization would be configured. This update is identified by the type code Type 3. Summary link (to an ASBR)—Sent from an ABR to a router that connects to the outside world (ASBR). It contains the metric cost from the ABR to the ASBR. This update is identified by the type code Type 4. External link—Sent to the ASBRs to which the organization is directly connected. This update is identified by the type code Type 5. Q18. Where does the backbone router reside, and what is its function? Answer: OSPF has special restrictions when multiple areas are involved. If more than one area is configured, one of these areas must be Area 0. This is called the backbone. When designing networks, it is good practice to start with Area 0 and then expand into other areas later. The backbone must be at the center of all other areas—that is, all areas must be physically connected to the backbone. The reasoning behind this is that OSPF expects all areas to inject routing information into the backbone; in turn, the backbone will disseminate that information into other areas. Q19. Are there any considerations for OSPF configured with VLSM sending routing updates into RIPv1? Answer: If OSPF sends updates into RIPv1 and those updates include routes with VLSM, all the mask information will be lost. This is because the routing protocol RIPv1 has no concept of VLSM and does not propagate the subnet mask. Static routes will have to be configured for the RIPv1 process to understand these routes. It should also be understood that the routes sent into RIPv1 will have to summarize into one classful mask. Q20. There are two types of summarization. What are they? Interarea route summarization—These routes are sent between areas. The ABR will summarize routes if the network within the area was designed using contiguous addresses, conforming to both a physical and a logical hierarchy. External route summarization—These are routes sent into OSPF from another routing protocol. This summarization also demands a hierarchical design using contiguous addresses. This is employed at the ASBR. Q21. Can the following subnets with a mask of 255.255.255.0 be summarized? If so, state the subnet and mask that can be used. Answer: The subnets can be summarized to 19.44.16.0/20, with a mask of 255.255.240.0 or /20. Q22. Why can interarea summarization be configured only on ABRs? Answer: Interarea summarization can be configured only on ABRs because of the topology table. Every router within an area knows of every link and, therefore, every network within the area. Every router shares the same topology table; they are identical. Therefore, it is not possible to summarize within an area because the process of summarization subsumes subnets. The ABR is the only router that has knowledge of several areas and thus that is capable of summarizing among them. Q23. What command would be used to create a totally stubby area? Answer: The command area area-id stub no-summary will create a totally stubby area. This is a subcommand to the router ospf process-id command. It is necessary only on the ABR. Q24. What is a virtual link, and what command would be used to create it? Answer: A virtual link is a link that creates a tunnel through an area to the backbone (area 0). This allows an area that cannot connect directly to the backbone to do so virtually. The command to create the link is area area-id virtual-link router-id. Note, the area-id that is supplied is that of the transit area and the router-id is that of the router at the other end of the link. The command needs to be configured at both ends of the tunnel. Q25. Where would you issue the command to summarize IP subnets? State the command that would be used. Answer: Summarization is done at area boundaries. The command to start summarization is the area range command, with the syntax area area-id range address mask. Q26. How would you summarize external routes before injecting them into the OSPF domain? Answer: The command summary-address address mask is the command that would be used.